A high percentage of Germans like to cycle on holiday. Many Germans like to go on holiday in their own country. This is good news for the rest of us as it means tourist authorities all over Germany are hard at work laying out new cycle routes and improving those they have already. The Allgäu is a area between Baden Wuerttemberg, Bavaria and Tyrol, which is much visited by people who want quiet rural holidays. 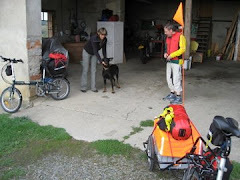 In order to cater for normal cyclists six counties, three provinces: Baden Wuerttemberg, Bavaria and Tyrol, and two countries Austria and Germany have developed an amoeba-like circular route around the Allgäu and incorporated two earlier routes across the middle. The Allgäu is the cheese producing region of Germany, home to thousands of light brown cows with soulful eyes, green meadows, high roofed farmhouses and forests with the Alps in the background. We have cycled along the eastern edge to Füssen on the Romantic Road and written two guide books about the route: "Cycling the Romantic Road from Würzburg to Füssen" (eBook) available from Smashwords and Amazon. The route is 450km long, mainly tarmac with some hills. 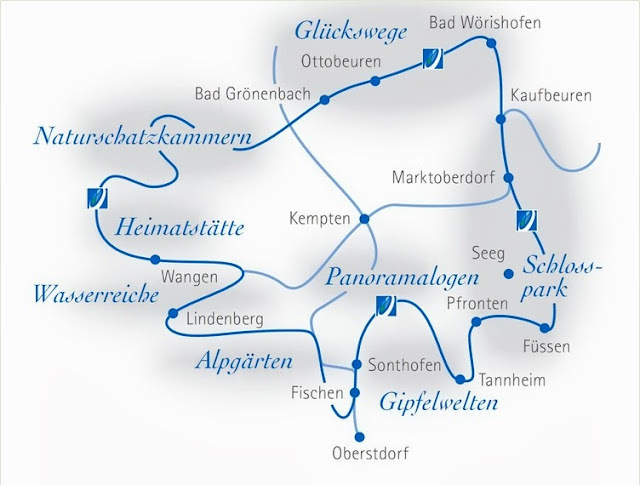 The Iller and Allgäu routes cross in Kempten and link the parts of the Allgäu route together. It is due to open on 2 June 2013. Our summer activities are already planned unfortunately, but given the chance I suspect we will go. The sketch map is taken from the website www.radrunde-allgaeu.de (in German) which is published by Allgäu GmbH, Gesellschaft für Standort und Tourismus, Allgäuer Straße1, 87435 Kempten, Germany.